Flies serve a vital function in nature. They are important for the decomposition of animal carcasses and serve as a food source for many animals and even some plants. Unfortunately, they also invade our homes and offices where they can often become a nuisance factor. More importantly, they often find their way into food preparation areas in either private or commercial kitchens as well as food processing facilities where they are capable of carrying disease-causing organisms. 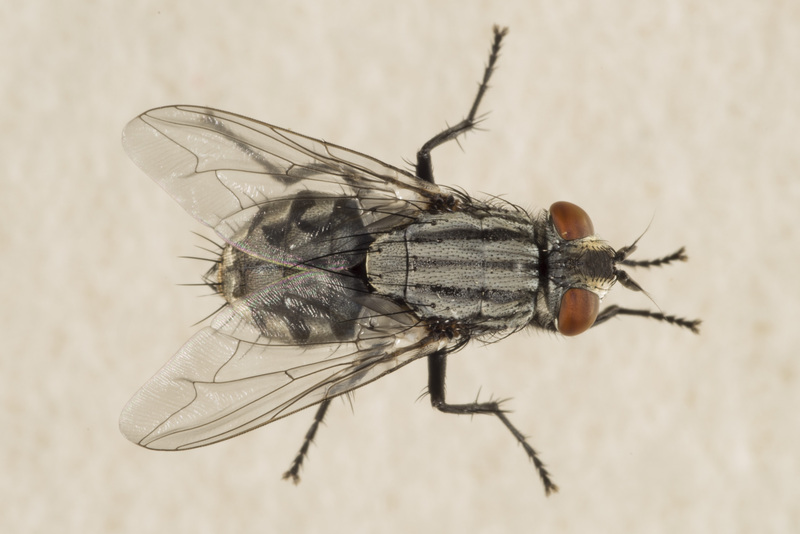 House Flies: Medium size gray fly (1/4”), prothorax has 4 dark stripes, fourth longitudinal vein has sharp curve toward the leading edge, calyptere (flat appendage found just behind the wing) is bare and contain no tuft of bristles or hairs. 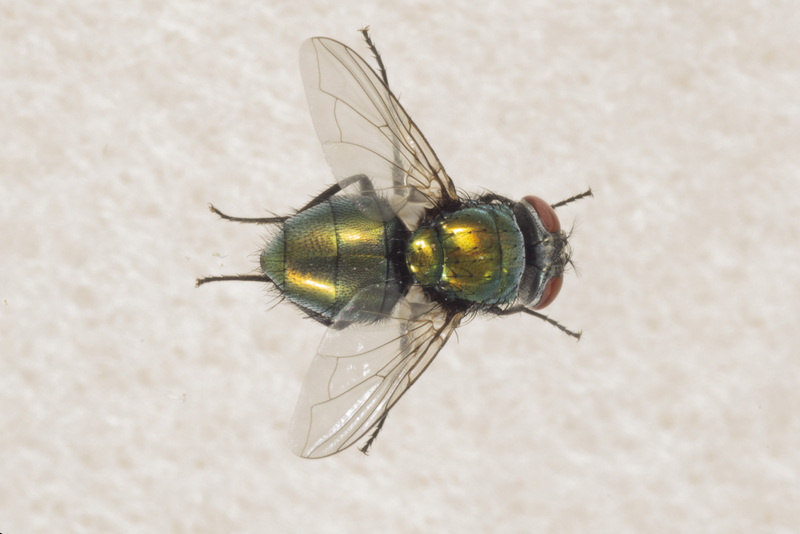 Blow/Bottle Flies: Medium size flies (1/4”), metallic sheen to body. The color varies but most commonly blue, blue-green, or green. Metallic-looking sheen is key characteristic! 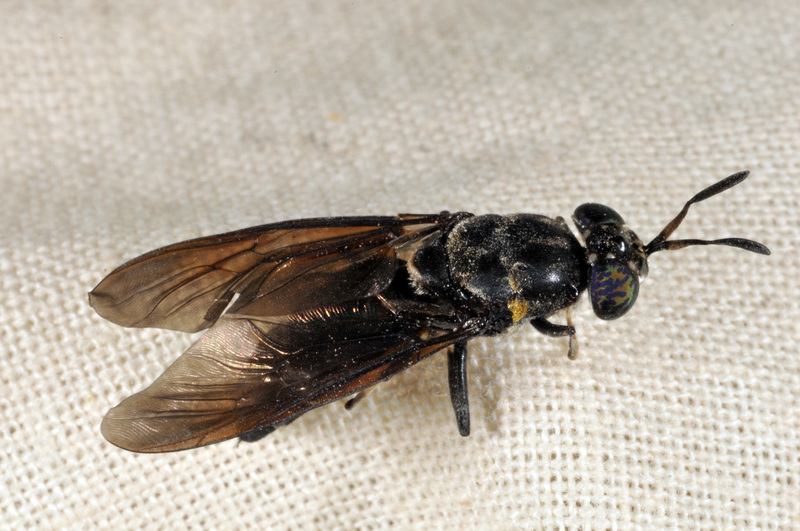 Soldier Flies: Large dark colored fly, flattened appearance, 2 clear looking patches on top of abdomen. Larva grows to over 1”, is dark brown and flattened. Very distinct larvae and pupae – should not be confused with any other fly in or around structures. Flesh Flies: Large gray flies with checkerboard pattern on top of abdomen and 3 dark stripes on prothorax (unlike house fly that has four). All of these flies are associated with garbage and filth. All but the flesh fly will breed in decaying organic matter. Blow, bottle and flesh flies will also breed in dead animals while house and flesh flies will also deposit eggs in manure. Larvae typically leave the breeding site to seek drier areas to pupate. 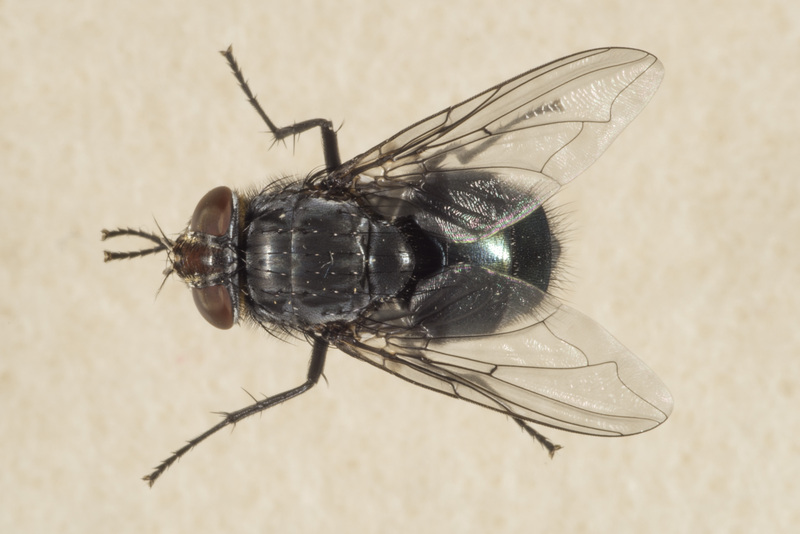 House flies are strongly believed to be capable of spreading disease-causing organisms. 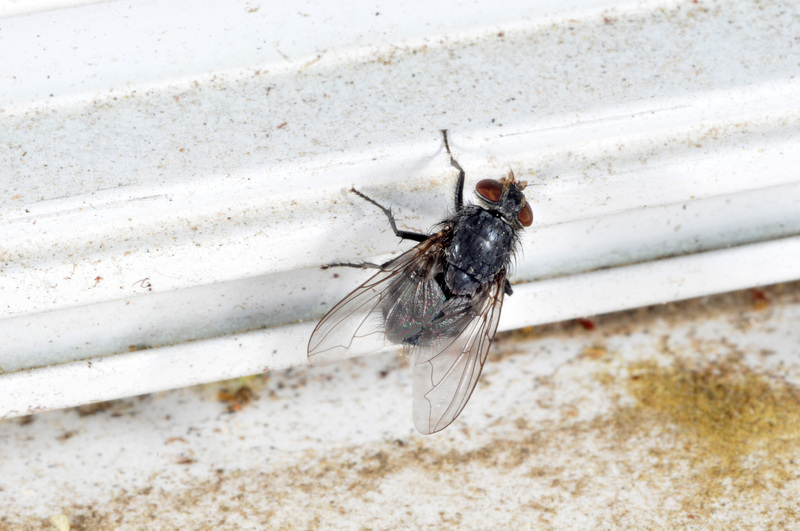 Filth flies generally enter structures from outdoors, since breeding sites are rarely found inside. Dumpsters where garbage accumulates, or that are not cleaned on a regular basis, are prime breeding sites for filth flies. When found inside a structure blow, bottle and flesh flies are usually found on breeding in dead rodents located within wall voids or ceilings or rodent traps and glue boards not serviced regularly. • Larvae only survive in organic matter that is moist. • Overlooked boxes of vegetables (house, blow, an bottle flies). • Trash cans, compactors, dumpsters. • Rodent traps, glue boards. • Attic or crawl spaces for dead birds, rodents, or cadavers. Sanitation of dumpster areas is primary to controlling flesh flies. A regular cleaning schedule should be established for not only the dumpster but the area surrounding the dumpster. The placement of the dumpster is also important in preventing flies from entering the structure. Dumpsters should be located as far from the structure as possible. Surfaces such as walls and the ground near doorways and dumpsters can be treated with a residual insecticide (wettable powder or microencapsulated). Fly baits can be used in dumpster area, however, they need to be reapplied after every cleaning and rainfall. Exclusion from the structure is the second step in fly control. Any cracks around doors and windows should be sealed as well as holes in window screens. Employees should be made aware that doors and windows need to be kept closed unless properly screened. The occasional filth fly that makes it into a structure can be removed with insect light traps.